Adjusting a knitting pattern to suit your tastes and yarn at hand is simply done, especially with an easily adaptable pattern. This free cowl pattern by Gretchen Tracy, uses a US 8 (6mm) circular needle, 2 skeins of DK yarn or about 218 yds (200 meters). 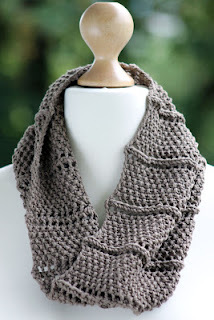 Gretchen has used a silk yarn for knitting her Ridge and Furrow cowl prototype pictured here. The Ridge and Furrow cowl drapes beautifully around your neck, soft and feminine. Imagine a fancy dress cowl with some beads or sequins mixed in. You'll need two skeins of Artyarns Beaded Silk and Sequins, a little pricey, but oh là là at holiday time, peaking out from under your coat for that special party. Or, according to the comments on Gretchen's post, you can also knit this lovely cowl pattern with chunky yarn, 14 sts = 4 in and cast on 80 sts. The pattern is in 10 stitches, so it's easy to adjust your cast on stitches and needle size for any yarn gauge. You can also use straight needles and sew up your finished cowl, instead of knitting in-the-round. I really can't say enough about Gretchen's blog and the generous amount of useful free patterns she offers. Balls to the Walls is definitely worth a visit and maybe even a subscription.